Kelly is a graduate of the University of Colorado with a Bachelor of Arts degree. Prior to that he attended the University of Kansas on an athletic scholarship. From 1995 to 2000 Kelly was employed as a bond field underwriter with EMC Insurance Companies, based in Des Moines, Iowa and Kansas City, Mo. Kelly left EMC and joined Zurich/Fidelity and Deposit Company as a senior surety account executive. He was responsible for all underwriting and marketing of surety bonds in Oklahoma for the company. 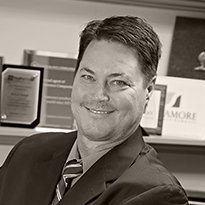 In September 2002, Kelly joined Rich & Cartmill, Inc.. as an associate partner and bond specialist. Kelly currently hopes to complete his Associate in Fidelity and Surety Bonding (AFSB) designation, and Chartered Property and Casualty Underwriter (CPCU) designations.